This Vrat lunch has dishes from South India as well, normally not seen in a North Indian vrat plate. It is very difficult for us South Indians to give up totally on our dishes at least some of them even for a North Indian Vrat plate. So after looking at the list of permitted ingredients and spices I realized we have several South Indian dishes which can easily be consumed after making very tiny changes.which was a relief to me! 2 tsp chopped coriander leaves. Oil/ ghee for making dosas . Make a smooth batter, lump free, not too thick, add other ingredients and rest for 15 minutes. 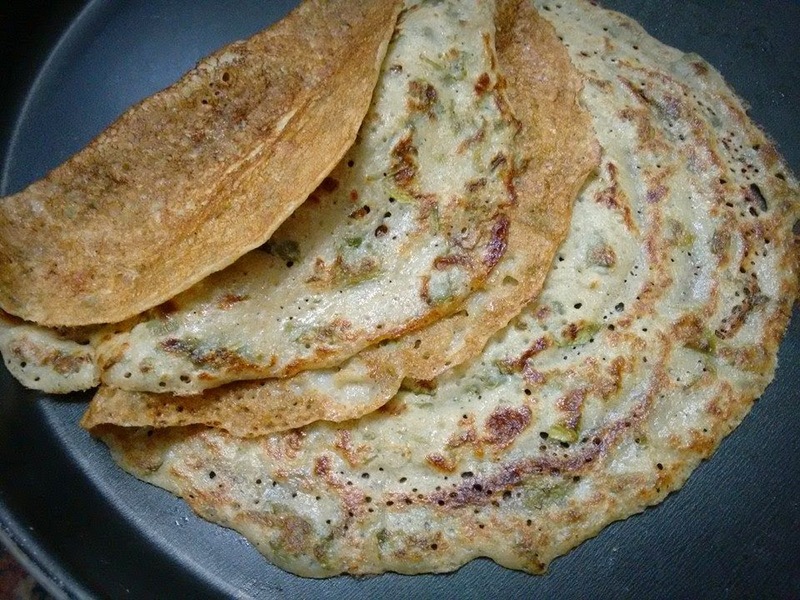 Make dosas in a pan with oil around edges. Enjoy delicious healthy kuttu dosas with curd, potato sabzi ( vrat ) or potato raita with curd, peanut curd chutney. 1 cup samvat chawal soaked in water for 2 hours.. Grind to smooth paste in mixie like a thick batter. Next take a small non stick pot or deep pan , add the batter , pinch of rock salt and add little water if batter is too thick and pasty, then cook it on a very low flame till the dough becomes shiny . Remove from flame, let it cool down . This is the basic dough with which we shall make the string hopper , steam it and then make other dishes out of the steamed string hoppers. After it is cooled a bit , while still warm, make small balls of the sevai dough, put each ball in the sevai press. 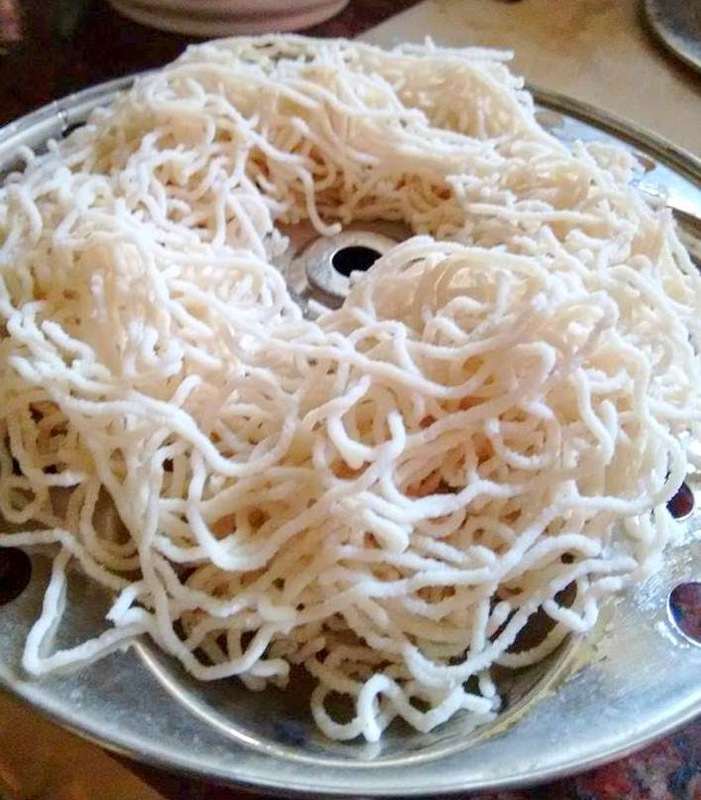 Make small rounds of the sevai strings in a greased idli plate , in each mould, squeeze out small rounds of sevai by pressing the sevai press..
After making sufficient nos. steam in a idli steamer for 12 minutes or till cooked. 2 tbsp roughly broken roasted peanuts. In a pan, add the oil ,cumin seeds, green chilies chopped finely, curry leaves, broken roasted peanuts. Add the cooked prepared sevai, stir gently. Add lime juice. Serve with sambar ( vrat) . 1 cup thick whisked yogurt. 1 tsp cumin seeds roasted and powdered. 1 tsp green chilies finely chopped. Mix the cooked pumpkin pieces with yogurt and other spices, stir well. Refrigerate till serving time. 1 medium sized banana stem tender. 1 cup fresh yogurt whisked. 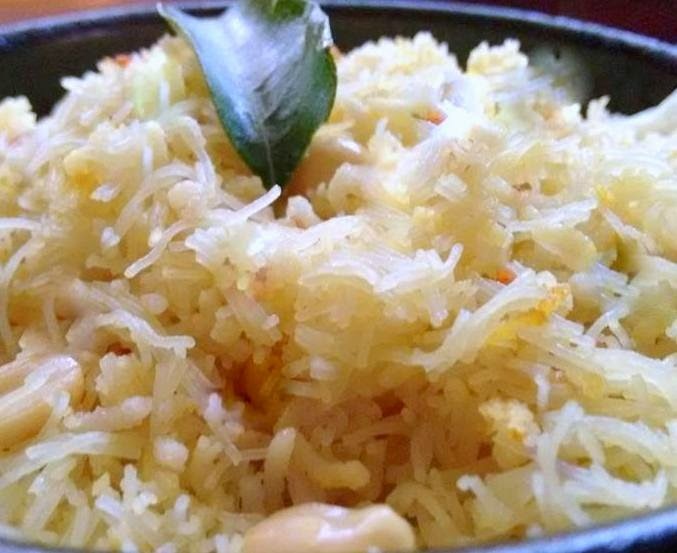 1/2 coconut freshly grated or use dry coconut powder . 1 cup thin buttermilk to soak the stem roundels before cutting them fine to avoid discoloration. 1 red dry chilly ( boriya) for tempering. Wash the stem and remove the outer covering which is thick and between the covers you will see the single white tender stem which has no outer cover but a shiny skin. Remove the layers of thick cover till you see the white stem and , peel the shiny skin on the tender stem, slice into thin roundels. You need to keep taking off the fibers which comes in thin strands as you slice . Drop the thin slices into a bowl of buttermilk to retain the white colour. After you have finished slicing the stem into roundels, chop them into small pieces and keep them also in buttermilk. Take a broad pan and cook the chopped pieces in little buttermilk itself and add some salt. Meanwhile grate the 1/2 coconut or the use the dry coconut powder / or kopra and grind into paste with little water along with 2 green chillis and 1 tsp of cumin seeds. The stem pieces would have cooked quickly if they are very tender and and then add the ground paste and let it simmer on low flame , add the whisked yogurt and keep for a minute on the gas and then remove. Do not let it cook further once yogurt is added. Just a gentle boil will do. The gravy would have thickened after adding the coconut paste and the yogurt. Take a small pan for the tempering, with 1 or 2 tsp of oil, add cumin seeds and sprigs of curry leaves, 1 red round chili (boriya mirchi )) and pour the seasoning on the gravy. 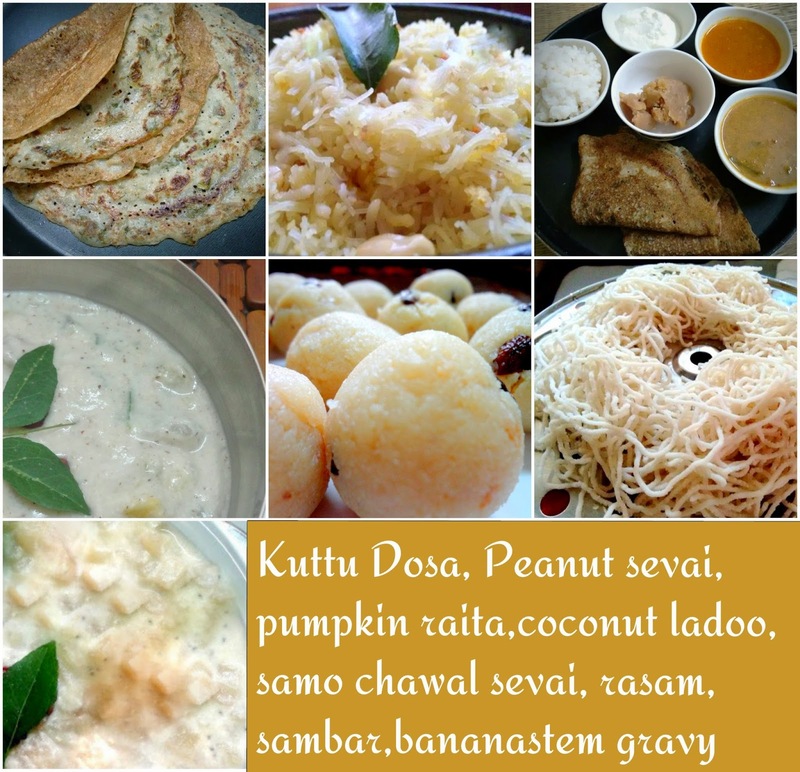 Serve hot with samvat chawal for vrat during Navarathri . Store in a bottle and refrigerate. Stays good upto 5 days . Some strands of saffron soaked in little milk. some fried cashew nut bits and fried raisins. Add the freshly grated / coconut or the unsweetened desiccated coconut powder , keeping some desiccated coconut powder aside for rolling the ladoos in it., in ghee and saute them on low flame . Around 3 minutes only. Add the sweetened condensed milk and milk powder into the nonstick kadhai and mix all the ingredients well. lower the gas flame flame and keep stirring making sure the contents do not stick to the pan. Add the green cardamom seeds powder and few strands of saffron, mix well. Add some roasted or fried cashewnuts and raisins sauteed in ghee into the mixture. Cook the above mixture for 2 to 3 minutes or so till the whole mixture comes together. Switch off the gas and let the mixture cool down before you roll them into ladoos. Grease your palms if necessary before rolling small balls of ladoo, actually it wont be needed as we have added ghee in the beginning itself. Finally roll the small balls of ladoo in some reserved desiccated coconut powder or reserved grated fresh coconut. These yummy coconut balls will remain good for a week in the refrigerator and also by keeping in the refrigerator, they will firm up even more and remain non sticky. 1/2 tsp cumin seeds for tempering. curry leaves or coriander leaves for garnishing. Cook the 2 cups of peeled cubed yellow pumpkins till soft , keep aside. Next dry roast the spices, 2 tsp cumin seeds, pepper, dhaniya seeds, red chillies and powder in a mixie , keep aside. Pour it in a vessel to make rasam. Add the powdered spice mixture to it, add the rock salt, curry leaves . After boiling, add little more water to thin it. Remove and prepare the tempering of cumin seeds with oil or ghee, add curry leaves or coriander leaves for garnishing. Add lime juice after removing from gas. Tasty vrat based rasam is ready even without using lentils.